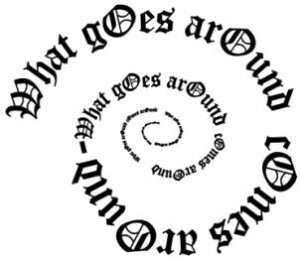 What goes around comes around. In this edition of Kombucha News, Kombucha Kamp gets lots of internet love and asks you to pay it forward and engage in your own community. Enter Lili Chin, graphic artist, dog lover and ice cream maker. I met Lili at the LA Food Swap, where we traded Kombucha for bacon ice cream. 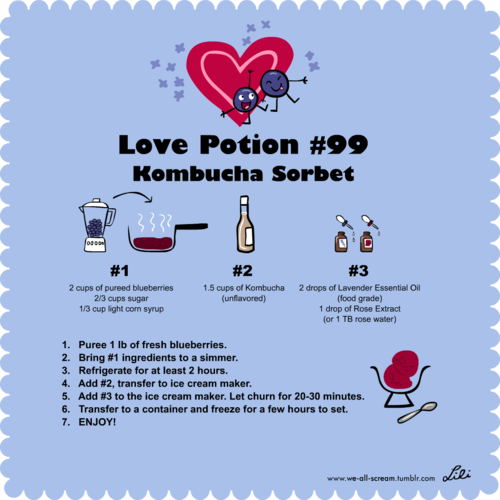 Being an experimentalist, she invited me over to her place to whip up a batch of Love Potion Kombucha sorbet. Check out this and a bunch of other amazing recipes on her adorably illustrated blog, We All Scream. Feel inspired to share your homemade booch or kombucha sorbet? Start a food swap in your community! Emily Ho of LA Food Swap has some tips on how to get one going in your neck of the woods. I enjoyed a visit from Austin Durant, founder of the Fermenter’s Club. We had the distinct pleasure of meeting first at the Freestone Fermentation Festival in May. Austin is fermenting a culture revolution of his own. Check out this video interview from his visit to Kombucha Kamp. Get Cultured! Start a fermentation club in your town. Austin has loads of recipes and ways to connect with fellow fermenters at his website. Two more lovely ladies were feeling the Kombucha love recently. Fellow Angeleno and friend Sabrina Bolin has just started a new blog and wrote a couple of posts about Kombucha. 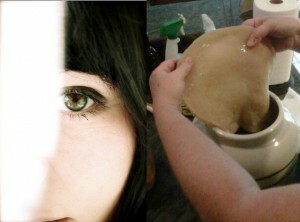 Swing by MyMiBoSo (deactivated) and check out Sabrina’s beautiful photos and creative presentation of how to make KT. Another accomplished homebrewer, Kelly Villareal, shared her journey of learning to make Continuous Brew Kombucha on the Texas Daily Harvest blog. Now I’m asking you to pay it forward. and giving them the gift of health! Hannah! I’m only just now seeing this and can I just saw a HUGE thank you for being my Kombucha inspiration and support! You’ll also be happy to know that I’ve got a new Kombucha convert :). As I’ve been avoiding alcohol lately I brought a big bottle of the Booch to a birthday party in lieu of a bottle of wine and my friend Sam kept “accidentally” drinking from my glass. By the end of the night he convinced his wife to start the homebrew! I love how that happens. Yeah! Way to spread the Kombucha love =) Its always fun to bring a bottle to gatherings and see how others respond – KT has high vibrational pull!